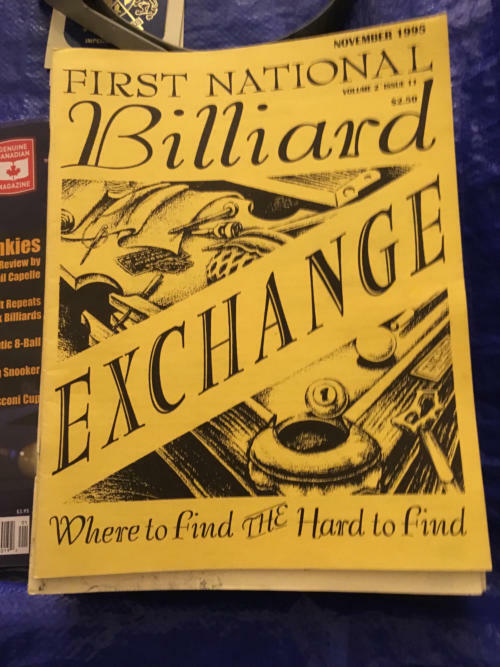 BOOKS, MEMORABILIA, SOUVENIR CLOTHING, ALL SORTS OF OTHER STUFF NOT RELATED TO BUILDING CUES BUT THAT I HAVE ACCUMULATED OVER THE YEARS WITH ALL MONIES COLLECTED FROM THESE SALES GOING TO THE UNITED STATES BILLIARD ASSOCIATION TO HELP THEM PROMOTE JUNIOR AND WOMEN’S BILLIARDS INSTRUCTION. 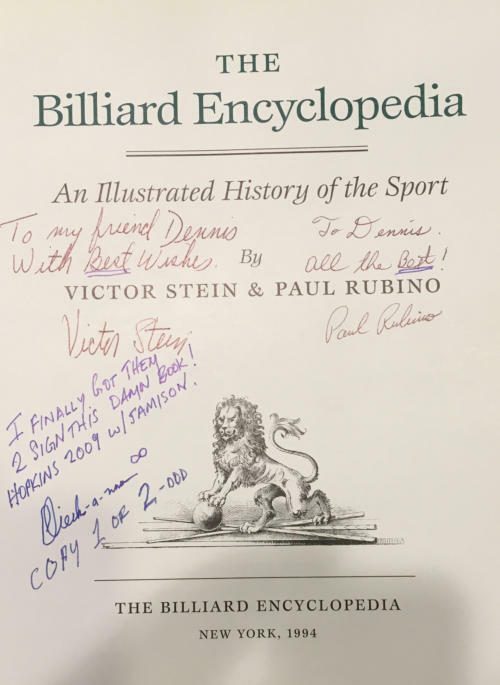 CLICK ON ANY IMAGE TO ENLARGE IT This is the FIRST EDITION of THE BILLIARD ENCYCLOPEDIA written by Victor Stein and Paul Rubino. 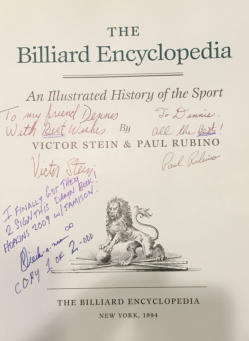 It is a very rare copy as both Victor and Paul, very good friends of mine, signed it for me at my request. 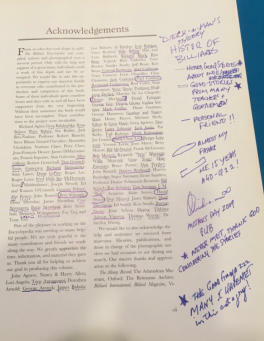 I have also annotated it as you can see which really makes it really one of a kind. 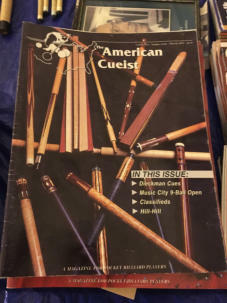 You can have this for $1000 which I will donate to the United States Billiard Association to help them promote their women’s and junior educational programs. This is true one of a kind collectors item. 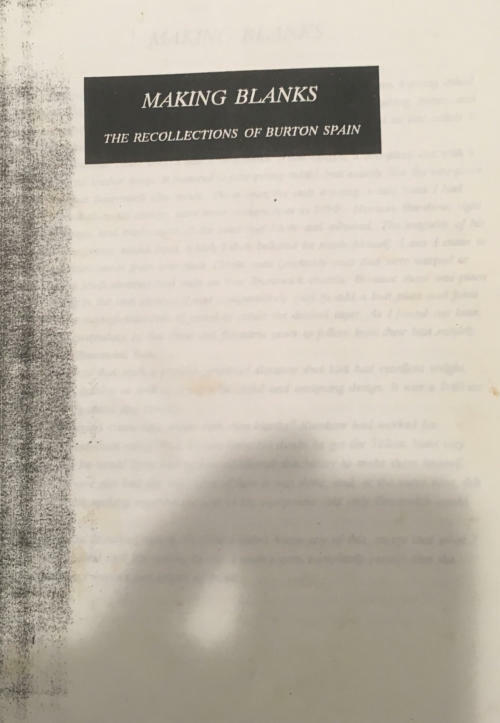 My fellow MENSA member Burton Spain wrote this and if you do not know who he is you know nothing. It is not that long but well worth reading as my friend was a genius. I have made ten copies of this work and will autograph them and and number them 1/10, 2/10 etc so if you would like one of these ten copies send me $100 which I will donate to the United States Billiard Association to help them promote their women’s and junior educational programs. 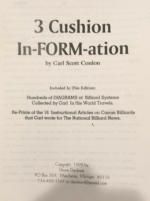 These are the writings of Carl Conlon, my father of billiards. 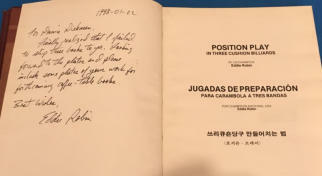 This tome is an inch thick and covers shows many systems that he collected over the years from some of the greatest teachers of the game all over the world. 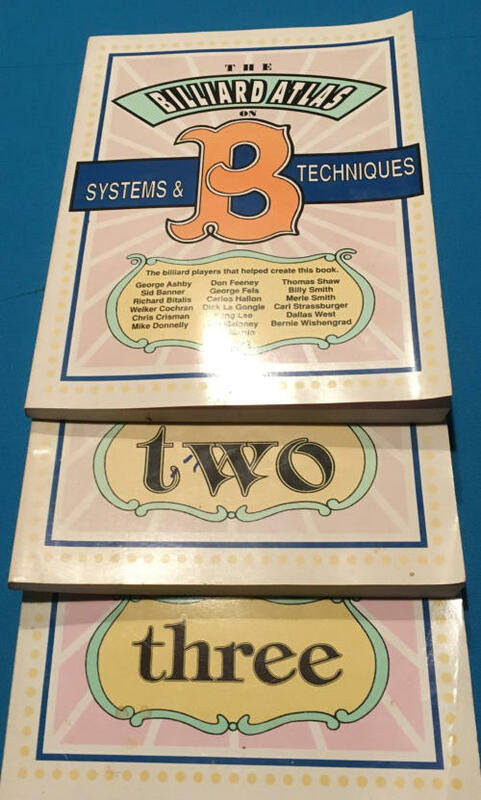 It also includes essays he wrote on the mechanics of the game which i think are moe in-FORM-ative than the systems. 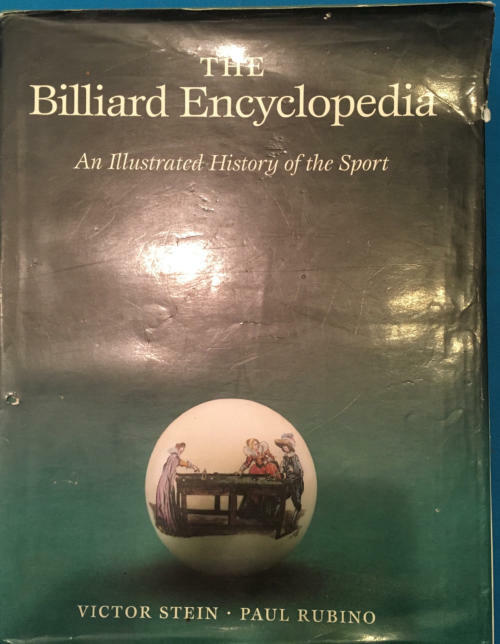 Again any money i get from the sale of my friend and pseudo-father Carl’s writings, will be donated to the USBA to promote women’s and junior 3-C billiards. Send me $200 if you want a copy. 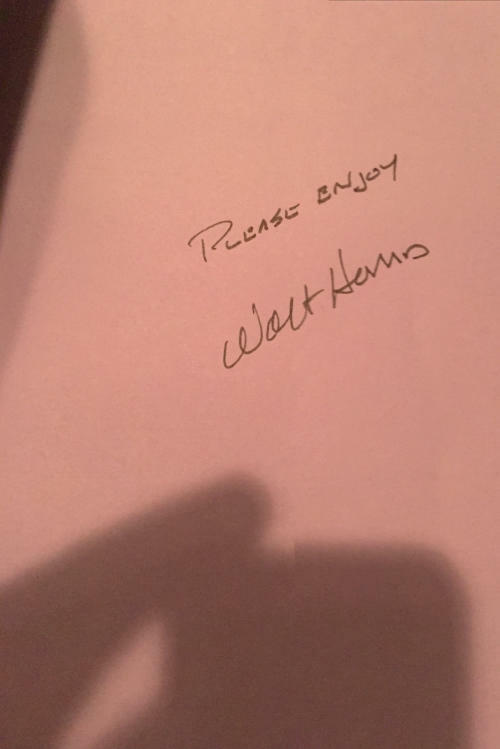 Another true collector’s item as my dear friend Walt autographed each copy. What you see is what you get and these are the only copies I have. The first Atlas devotes forty pages to the CLOCK SYSTEM I taught him. 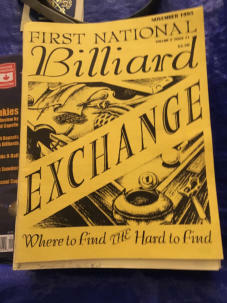 $500 for the set with all monies going to the USBA for Junior and women’s 3-C billiards. 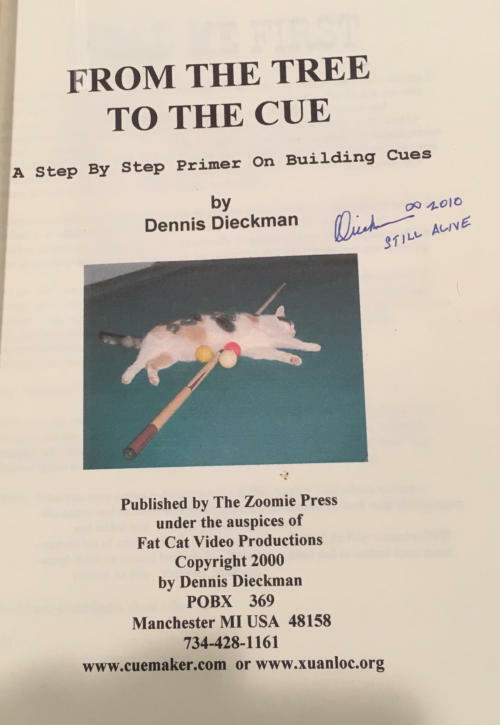 MY WRITINGS ON WHAT YOU NEED TO BUILD A CUE THAT WILL LAST FOREVER. The information is stone age but as a collector’s item it is well worth the $250 I want for it. Again all money will go to the USBA. These are VHS tapes [hope you have a player still that works] and the content is available free on youtube but i have four copies left from the 100 i had made which should make them collectors items. 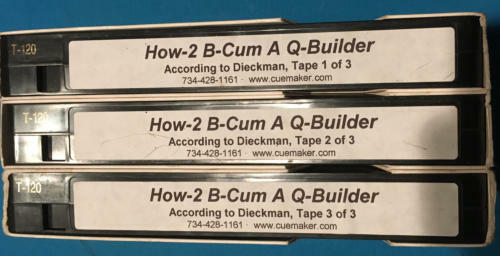 I produced the in 2002 and this was the third edition of cue building video i had been putting out since 1990. 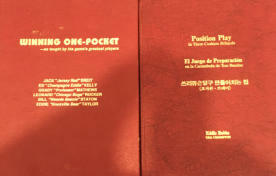 I have no copies of the first two editions so if you some of them you really have something. 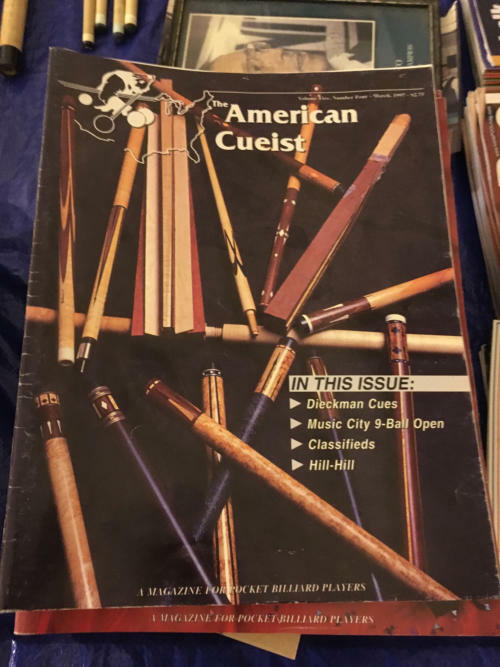 $250 [original price was $1000] will get you a set for your collection, all money going to the USBA. They come autographed. 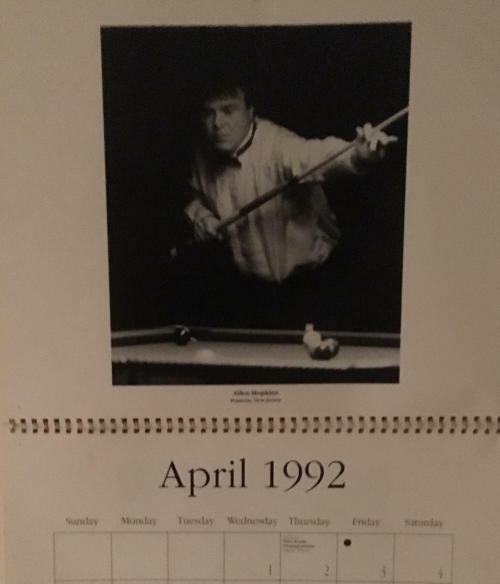 I have one copy only of this famous calendar. Make me an offer, don’t be a Cheap Charlie, and it is yours with once again all monies going to the USBA for their educational programs. 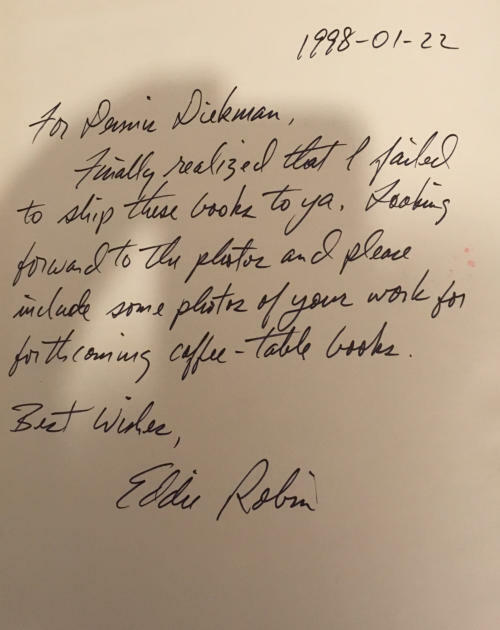 EXTREMELY RARE Eddie Robin Once told me he never gave out his autograph to anybody and i told him: “EDDIE….YOU OWE ME A BIG ONE FOR THE PHOTOS I SENT YOU FROM CARL CONLON.” And so he complied. The “upcoming coffee-table books” that he mentioned never happened. 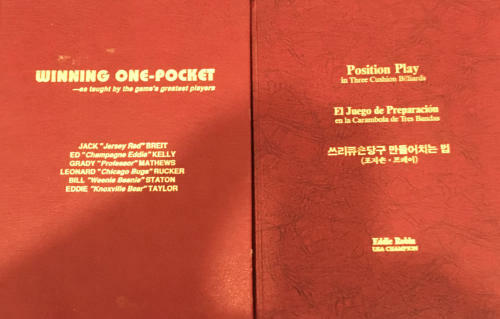 Winning one pocket is not autographed but I will sign it as being mine if you wish. He only had printed 500 copies of each of these books. 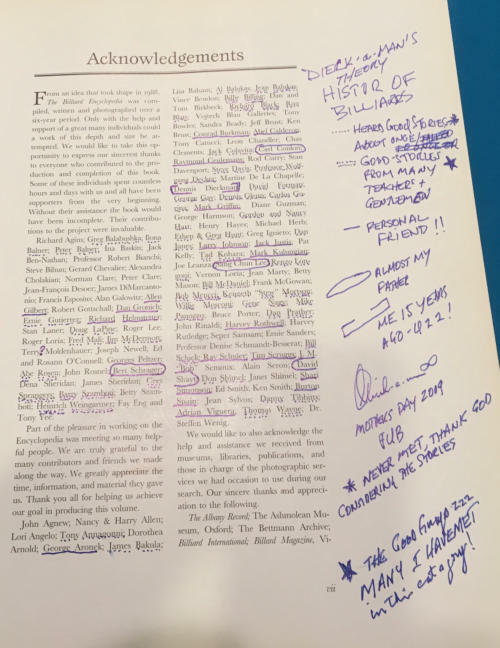 Notice how he dates the inscription he wrote; Eddie was a weird duck. 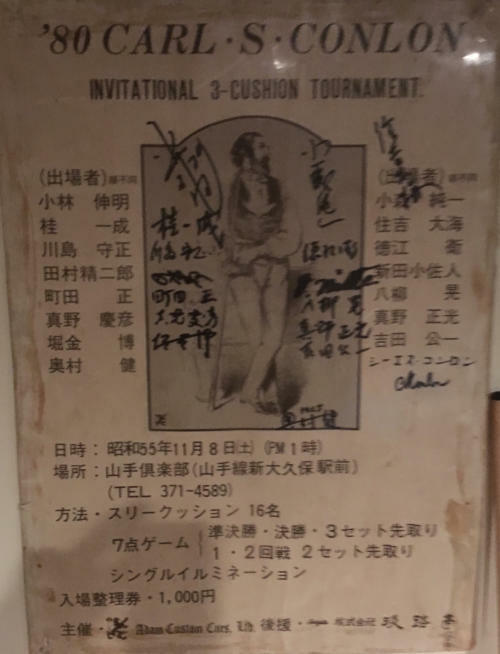 WINNING ONE POCKET has been sold for $300. 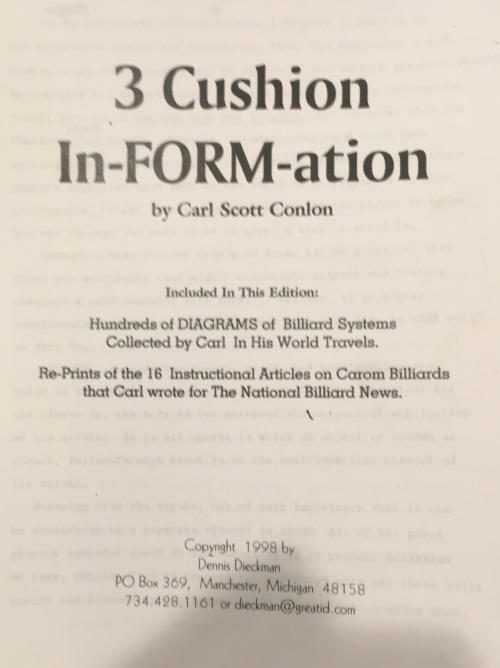 POSITION PLAY IN THREE CUSHION BILLIARD is still available for $500 Proceeds to the USBA Widows and Orphans Fund.